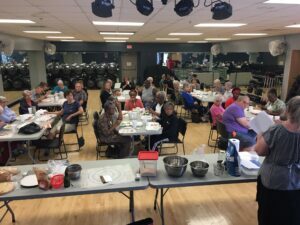 Our monthly Healthy Eating and Tasting (HEAT), presented by UAMS South Arkansas Center on Aging, Healthworks Fitness Center, SouthArk and the Medical Center of South Arkansas, was held Tuesday, October 9th. Bonnie Senn provided a step-by-step demonstration of how to make fresh sourdough bread & pizza crust! The bread is authentic long rise without yeast or sugar. 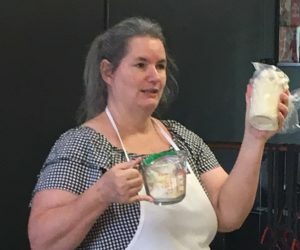 Bonnie discussed the many health benefits of using sourdough bread, including easier digestion by the bacteria-yeast combination working to predigest the starches in grains. Predigestion by sourdough leads to less digestion for your body. Sourdough bread made with wild yeast, bacteria, and whole grain flour is the oldest and most original form of leavened bread. It truly is an ancient art that is crafted in harmony with nature. For more information about the HEAT program, or to join us next month, please call the South Arkansas Center on Aging at 870-881-8969.